French Pyrenees ski holidays, chalets, apartments, catered and self catered accommodation - a great place for mountain lovers, skiers and snowboarders. For useful ski information on French Pyrenees look at the French Pyrenees ski area overview. Stretching from the Atlantic to the Mediterranean, the resorts of the Pyrenees combine tradition, charm, convenience and outstanding natural beauty. The Pyrenees mountain range runs along the French-Spanish border, with the small country of Andorra sitting in the middle. It is 400 Km long and 70 km wide. There are many small resorts within the Pyrenees - around 38 in total at the last count - with around 1000km of pistes. They range from traditional villages such as Barèges, one of the first French ski areas, to the more purpose built style such as at Superbagneres and the resorts in Ax Trois Domaines. As the resorts are less well known than their Alpine counterparts, they tend to be less crowded. Getting to the Pyrenees has got easier in recent years with low cost carriers opening up routes to Perpignan and Carcassonne. Montpelier, Toulouse and even Barcelona, across the border are also all very feasible places to fly to for holidays in the Pyrenees. The rail network in the area is also fairly extensive. At the foot of the Pic du Midi Mountain the Domaine du Tourmalet is the largest resort in the French Pyrenees. The Tourmalet resort comprises the villages of Bareges and La Mongie. In total there are 69 pistes (5 black, 20 red, 21 blue and 23 green), 100km of pistes and 42 lifts (plus the Pic du Midi de Bigorre lift, now open to skiers for off-piste). 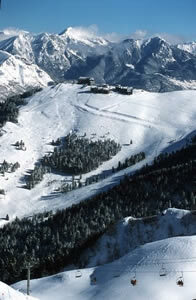 Resort altitude is between 1400 and 2500m, but there are also two return pistes directly to Bareges at 1250m. There are six mountain restaurants, as well as a big choice of eateries in Bareges and La Mongie. The resort is extensively equipped with snow cannons, and the excellent snow park has a big air, boarder cross, tables and rails. Bordering the national park of the Pyrenees this ski area is picturesque and exciting. The resort is made up of two areas, Le Cirque du Lys is dedicated to downhill skiing and boarding, whereas Le Pont d'Espagne is a haven for cross country skiing, raquetting and walking. Saint-Lary has 100 Km of pistes covering 700 hectares of skiable area, and is spread across 3 areas: St-Lary 1700 - Pla d'Adret, the family heart of the resort; St-Lary 1900 - Espiaube is for the more experienced skier and is linked to 1700 by road and pistes, it is also the starting point of the 3.6 Km "Mirabelle" piste, which is one of the longest runs in the Pyrenees; St-Lary 2400 is the home of the snow park, this area is also a good spot for walkers. The old mountain village, Luchon, is at 630m altitude and is linked to the ski resort of Superbagnères by 17 Km of road or by an 8 minute gondola trip. The Vallèe d'Ax is made up of 4 skiing areas: Ax 3 Domaines, Ascou-Pailheres, la Chioula and Beille. Ax 3 Domaines and Ascou-Pailhere provide tree-lined, downhill, Alpine skiing suitable for beginners and children. The other two areas, la Chioula and Beille, provide extensive cross country skiing pistes with Beille being the oldest cross country ski resort in the Pyrenees. One of Europe's oldest winter resorts, Font Romeu has been welcoming skiers since 1921. It remains a lively and popular border resort attracting weekend crowds from Spain as well as France. It has the biggest snow making operation in the Pyrenees and the second biggest bed base. Font Romeu itself is an historic town, about 200km from the city of Toulouse and just 90 km from Perpignan. Facilities include a casino, climbing wall, dog sledding, horse riding, ice hockey, judo, a library, squash, tennis and marked winter walking routes. The ski lifts are 4km (2.5 miles) away in the newer purpose built section of the resort..